A good understanding of how the Renaissance unfolded in Italy must take into account the geography and diversity within the large Italian peninsula. The Italy as we know it today is a relatively modern creation, and for much of its history the peninsula was controlled by various city-states which warred with one another and exchanged control over regions from time to time. 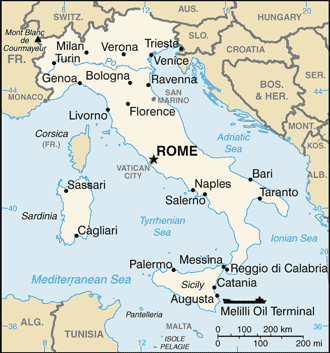 Some of the major cities or regions in Italy in the Middle Ages and Renaissance included Naples in the south, Rome, Florence, Siena, Pisa, and Umbria in the central region, and Milan, Genoa, and Venice in the north. While Rome occupied an unsurpassed role in the ancient world, the early years of the Renaissance were squarely centered around the city of Florence. It was there that a concentration of brilliant artists and architects brought their ideas to life, although for at least some of them it only came after they had made trips to Rome to see the ruins and old works from the imperial age. Eventually, the ideas of the Renaissance spread beyond Florence as humanist scholars throughout the peninsula became more attracted to the notion of emulating antiquity. Some of these ideas would be spread through written texts, such as the great work on architecture by Leon Battista Alberti, De Re Aedificatoria. Moveable type was invented by Johannes Gutenberg in the middle of the 1500s, and this made it easier to share both ancient texts and contemporary Renaissance ideas to more and more people. The center of Renaissance patronage would eventually make its way to Rome, where one of the most powerful of all art patrons lived – the Pope. By the beginning of the sixteenth century, papal patronage would draw some of the greatest artists to the Eternal City, such as Raphael and Michelangelo. Rome, however, would be sacked in 1527, causing people to flee from the city. The result of this was that artists and architects who had training in Rome brought their talents and knowledge of Roman design to other cities in Italy, increasing the range of places where ideas of the Roman Renaissance would become manifest. Cities such as Venice, which became the new home of the great sixteenth century architects Sansovino, Sanmicheli, and Serlio, greatly benefited from this. Local Italian painters, aided in part by the popularization of oil-on-canvas as an artistic medium, created works not merely for national clients, but also for international patrons, which thereby introduced Renaissance ideas to a wider audience. For example, Leonardo da Vinci painted for Italians while in Italy before he left for France to paint for King Francis I. The painter Titian painted for leaders in his hometown of Venice, for regional leaders in Italy, such as Alfonso d’Este and Federico Gonzaga, and eventually for international figures, such as monarchs Charles and Philip II of Spain, and Mary of Hungary. The transmission of aesthetic ideals and humanist ideas was therefore able to spread well beyond the Italian peninsula and influence a large number of artists and thinkers throughout Europe. ItalianRenaissance.org, "The Italian Peninsula," in ItalianRenaissance.org, June 28, 2012, http://www.italianrenaissance.org/the-italian-peninsula/.